That’s how some transportation reformers are describing the American Association of State Highway and Transportation Officials’ new recommendations for the next surface transportation bill. The current bill, MAP-21, expires in less than a year. AASHTO’s proposal is “so mired in protective technical-speak that it’ll fail to inspire anyone outside of state DOT technical staff — which I guess just sees ‘more money’ and that’s all they care about,” vented Deron Lovaas of the Natural Resources Defense Council upon seeing the document. MAP-21’s one real achievement, a provision allowing some degree of local control over funds for biking and walking, gets targeted in AASHTO’s wish list. AASHTO complains that states aren’t eligible for this relatively tiny pot of money, and demand to get their hands in the cookie jar that’s closed to them. What’s more, Lovaas noted, AASHTO boldly resists any form of accountability. The association insists that no additional performance measures be implemented until the new ones from MAP-21 can be amply tested out. And yet they want to go full throttle with their agenda to accelerate “project delivery” — basically making an end run around environmental and community scrutiny. Indeed, AASHTO is positively allergic to performance measures. They want to make sure states aren’t required to fix infrastructure that’s in the worst condition first, though they don’t explain why any other approach would make any sense. Over and over again, they affirm their “steadfast opposition” to “using performance measures as the basis for apportioning or allocating federal funds among the States” — in other words, having any mechanism whatsoever to ensure that they don’t spend billions of dollars on wasteful projects. Above all, AASHTO says over and over that “the implementation of MAP 21 [and any subsequent bill] should avoid any unnecessary administrative burdens or unnecessary restrictions on State flexibility.” Translation: Hand over a blank check. Nowhere does AASHTO say how it intends to improve the transportation system, meet national goals like greater safety or environmental sustainability, or be more accountable to the public. They don’t even bother to explain the expected outcomes of their recommendations. The list is nothing but “give us the money and go away,” in the words of David Burwell, transportation analyst at the Carnegie Endowment. Unbelievably, AASHTO also makes a grab for what’s historically been federal authority to determine whether projects conform with the Clean Air Act. While one state — California — has been awarded authority to do its own environmental reviews, that’s only because that state’s environmental regulations are more stringent than federal ones. The blanket request for all states to have the authority to regulate themselves on environmental protection is alarming. Perhaps not surprisingly, AASHTO’s section on safety doesn’t breathe a word about people walking and biking. Instead, the states again ask for more “flexibility” to focus on safety when and where they want. Oh, and AASHTO says it’s too restrictive to ask states to implement graduated drivers licenses, even though all 50 states have some version of a GDL system. AASHTO does have some good ideas. They want permission to remove from the National Highway System a lot of arterial roads that were automatically designated NHS under MAP-21. NHS designation means the road is treated as a highway, and can make it harder to install bike and pedestrian designs or traffic calming. Another good recommendation is their suggestion to allow states to fund any non-NHS bridge on the federal-aid highway system under the National Highway Performance Program (NHPP) — an arcane-sounding request that would help free up Surface Transportation Program money, which is one of the pots of funds that’s most available to bike and pedestrian projects. The additional burden of non-NHS bridges in the STP program in MAP-21 threatened to squeeze out these other important projects. They also want Congress to remove the cap on states using Congestion Mitigation and Air Quality money for transit operations — which has been limited to three or five years. But they also want to narrow the requirement that states spend CMAQ money on their intended purpose, saying that should only be required if states’ non-attainment of air quality goals is specifically the result of transportation activities. But essentially, with this document the state DOTs are asking for money with no strings attached in the next go-round — and undoubtedly they’re hoping their message will be heard deep within the ranks of U.S. DOT, where they’re currently working out the details of MAP-21’s performance requirements. And why wouldn’t AASHTO have high hopes that their demands will be heard? Sen. Barbara Boxer has been clear that she looked to AASHTO for guidance every step of the way in crafting MAP-21, and indeed, one would think AASHTO had gotten everything it wanted out of that affair — if it didn’t now have a list of so many more demands. I didn’t expect anything different from AASHTO. 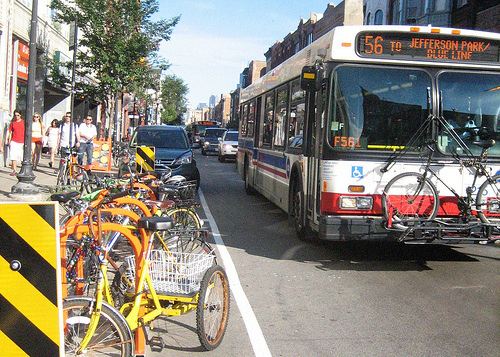 Does NACTO have recommendations for the next surface transportation bill? It would be good for legislators to review some alternatives if they’re not up to speed on transportation issues in their districts, regions, and states. What is that? The ultimate test of legitimacy in the transportation world? Whoever controls the biggest roads wears the pants around here! What are cities, like irrelevant? Yeah, that sounds good. Too bad it’s an opinion, not a fact. First, most highways are in fact locally owned: http://www.fhwa.dot.gov/ohim/hs00/hm16m.htm. Second, if you knew about transportation law you’d know that starting in 1991 — in a deal between a Republican President and a Democratic Congress which is hard to fathom today — the transportation law officially became intermodal, focussing on more than just highways in recognition of the fact that the system should be made up of more than that. I thought this post is about MAP-21. MAP-21 is about the federal aid highway system, not all highways. About 40 percent of federal-aid highways are not state-highway-administration-owned, and even those owned by states can’t entirely ignore other segments they connect to; it’s a network. And the highway title is one of several, the bill also has a transit title, a finance title and a research title, for example. It may have made sense for state government highway bureaucracies to dominate a national program several decades ago; it doesn’t make sense anymore given where most of us live and work: Suburbs and cities, which also generate the majority of gas tax revenue. We are the donors for this program, and I for one would like to see a greater return on investment.
? Thank goodness we have the Tea Party Republicans watching out for us, to protect America from this sort of socialism. Right? I cant seem to name any local road construction project that is funded without money from the TRANSPORTATION bill. It is not a highway bill for national highways. I’m not sure I understand the negativity of this whole post however. This appears to be the association’s legislative agenda. Why wouldn’t they advocate a pro-state agenda any more than the cities would roll out a pro-city agenda? As for those other titles, absent the nature of transit – it is heavily highway research and finance. EPW does not have much jurisdiction beyond that. EPW works with other committees to assemble the whole bill. T & I in the House has broader jurisdiction. It’s a transportation law, not just a highway law. This document is disappointing because it seems so parochial, and misguidedly so. State transportation agencies shouldn’t be looking out just for their special bureaucratic interests, and should focus on serving entire states, not just rural areas (can’t help but notice that AASHTO’s board is chaired by bureaucrats from largely rural KY and WY which may help to explain the parochial agenda). And assuming that state associations should look out for their lowest common denominator, and fight for their slice of the pie against city associations which should also represent their lowest common denominator, while perhaps the path of least resistance is uninspired and unlikely to yield good policy. It also leaves us suburbanites out in the cold. @a3925f095d9f341ac787e605183e846b:disqus your point is well taken. Everyone deserves to advocate for their own position and self-interest, AASHTO included. But given that AASHTO and the state DOTs are the most powerful agents in deciding what our transportation system will look like, it would be more inspiring if, rather than just looking to protect their own interests, they were setting visionary goals for moving the transportation system into the next century. They’ll get there, but unfortunately they’re way behind lots of other entities. What a terribly inaccurate statement in regard to freight. First, there are no new federal funds to ask for. Congress created this freight network but did not fund it. The most it did was authorize states to seek a higher match to their federal apportionment. Second, the NHS IS 160,000 miles. The freight network is only 27,000 miles. 65+% of all goods move by truck. 27,000 is a woefully inadequate capture of what is a much larger freight network. But, again, as there are no new funds, there is no new federal money to ask for. it’s a great network, true…but it’s been consolidated over last 30 years. there is 20% less rail capacity than in 1980.
to a point…but there was no rail title in MAP-21. That’s for PRIIA. there was no water title in MAP-21. That’s for WRDA. No air title either. Enter FAA. 80/20 rule is in play here. The roads owned/operated by the State DOTs carry significantly more volume of traffic than locally owned roads. In fact, for freight, the percentage is even higher. Unfortunately, the road in front of my house is of less importance to the region/state/nation as the segment of I-64 between Norfolk and Richmond. What are you implying about Kentucky and Wyoming? Um, that they are largely rural. Yeah, that doesn’t match legislative history. In the 1982 law, Pres. Reagan and Congress added a subtantial mass transit account to the highway trust fund. And in 1991 with ISTEA (the Intermodal Surface Transportation Efficiency Act) Congress and the Bush Administration boosted the role of metropolitan planning organizations in developing plans and programs for transportation, added dedicated funding for non-motorized transportation, and made a lot of money flexible so it could be used for non-highway purposes. This was done in recognition of the fact that the huge interstate hwy construction project came to a close after decades of work. TEA-21, SAFETEA-LU and even MAP-21 with its structural changes preserved most of that architecture: Transit, nonmotorized, as well as highways, a greater metropolitan role in planning, and a lot of flexibiliy to use funding for non-highway purposes. It’s a surface transportation law. the Louisville MSA is 1.3 million people. The Cincinnati MSA is 2.2 million, with almost 500k living on the Kentucky side. AASHTO’s last board chair was from Rhode Island, and before that Michigan. Re: Kentucky, I stand corrected. Huge rural population, but I didn’t realize the urban pop had risen above the 50% mark. A lot of growth happening in KY metro areas! But perhaps you’re counting total ton-shipments, while these are looking at ton-miles. For everything else that is time-sensitive and high density value (think of a container full of laptops or smartphones or designer clothes or refrigerated produce), trucking is often a better option because transshipment times are too much. Remember: we live on a just-in-time era, where for many items almost-zero stockpiles and dynamically managed supply chains are much, much more important than actual cost of transporting cargo from A to B.
I don’t understand the editorial board of the Streetsblog sometimes. They often complain of centralized funding with strings attached and centrally defined standards, then next week they complain of more local/state control. It appears they take a very casuistic approach: if it helps to bring more transit and bike lanes, by all means pass a federal law and tramp over “bigoted local authorities with short-term thinking”. But if the results are opposite, then by all means give control to local powers where at least locals have a shot of influencing policy. Looks a typical have-your-cake-and-eat-it-too case. Based on the research we’ve done fir the NJ state rail plan (freight oriented), intermodal traffic has been consistently increasing 33% per year for the past five years. UPS is a heavy user of the Croxton Intermodal facility that is operated jointly by NS and CSX. Long haul trucking is disappearing fast and last-mile trucking (from Secaucus to Queens for example) is becoming the new normal for truck operations. The budget and traffic counts if the Porr Authority of NY & NJ confirm this decline, based on toll revenue. At some point as real wages continue to decline people are going to want rock bottom prices. That will mean shipping by the cheapest method possible, which is usually rail. I suspect freight rail will garner a large fraction of the goods now going by long-distance truck. We’ll also need short-haul trucks to go from the rail freight terminal to the final destination but it wouldn’t surprise me if some big box stores located within a few hundred yards of rail lines started getting rail spurs. This may not happen in urban areas or inner ring suburbs with little undeveloped land, but many modern suburban shopping complexes are surrounded by mostly undeveloped land. Streetsblog doesn’t give a damn whether things happen at the federal, state, or local level — Streetsblog wants the *right thing* done. This is what I call “moral”. I wouldn’t be surprised if we see new intermodal rail-to-road terminals. There are surprisingly few in the US. Start putting a few more in the “gaps” and long-distance trucking will vanish entirely. Geoff, he just said you were factually wrong about that: rail carries more tonnage than trucks. *Right now*. The development and use of more fuel efficient vehicle technology must also be taken into account. Electric vehicles and alternative fuels to gas and diesel are gaining market shares. This in turn introduces a threat to traditional government funding: fuel tax suddenly erodes. And governments must look either for cost-savings or alternative sources of revenue..